Scientists have been able to observe sperm cells since the invention of the optical microscope. But capturing their unique swimming motion in 3-D has been surprisingly challenging — and that information is valuable because it could help explain the key physical attributes of healthy and defective sperm. Now, a microscope developed by researchers at the UCLA Henry Samueli School of Engineering and Applied Science and UCLA’s California NanoSystems Institute has made it possible to precisely track the motion of sperm heads and tails in 3-D with unprecedented accuracy and detail. The device, which uses holography and image reconstruction algorithms, is described in a paper (PDF) in Light: Science and Applications. The work was led by Aydogan Ozcan, UCLA’s Chancellor’s Professor of Electrical and Computer Engineering and Bioengineering and an associate director of CNSI. 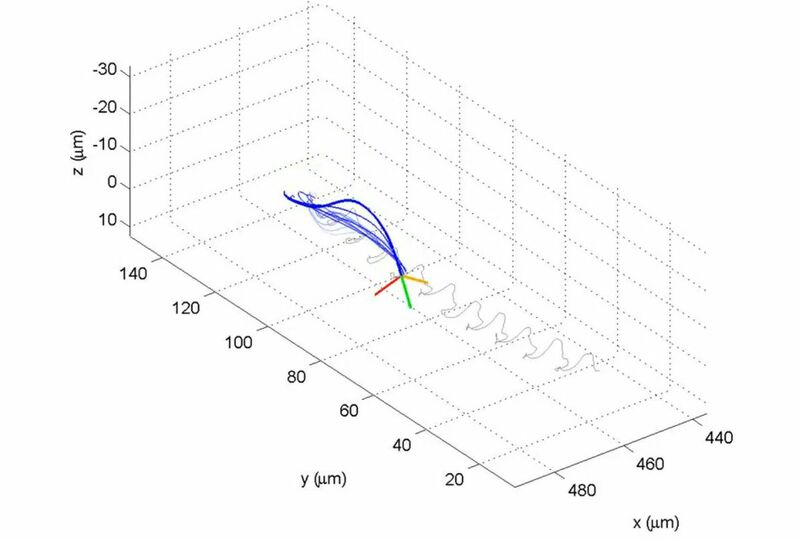 Most conventional microscopes in laboratories and clinical settings can only observe sperm’s movement in two dimensions across a very small sample volume, and they can’t capture details of sperm movement, like the spin of the sperm head or the rapid motion of its tail, or flagellum, that would be visible in 3-D.
Ozcan Lab/UCLA The device generates data that enables software to plot sperm movement in three dimensions over time. “Since our holographic microscope doesn’t use lenses, it has the ability to image sperm over a sample volume that is approximately 100 times larger than that of standard optical microscopes,” said Mustafa Daloglu, a UCLA doctoral student and the study’s first author. The system produces data that is then plotted on a 3-D graph, giving the scientists a visualization of sperm head spin and flagellar beating patterns over time. The computational imaging platform is made of inexpensive components, including an image sensor chip — which costs just a few dollars apiece and is like the ones used in mobile phone cameras — and two light-emitting diodes, which are used to illuminate the sample. To use it, researchers place the sperm sample in an observation chamber (which can hold more than 30 microliters), on top of the image sensor. The two LEDs are positioned outside of the container, and slightly tilted toward each other so that they will cast shadows from the moving sperm cells onto the image sensor. “Because of how the two LEDs are positioned, each individual sperm generates two separate shadows from different angles — each containing holographic information that is used to reconstruct a digital 3-D image of the sperm body through algorithms,” said Wei Luo, a former UCLA doctoral student and a co-author of the paper. Not only will the system be able to provide useful 3-D data to validate existing models and theories on sperm locomotion, it could also lead to new insights in micro-robotics. “Understanding the spin of the sperm head and beating patterns of the flagellum could help engineers design more advanced microscale robots that would mimic the way that sperm move and sense their environment,” Ozcan said. Other members of the research team were UCLA undergraduates Francis Lin, Inje Lee, Vishwajith Ramesh, Kevin Kim, Jiaqi Jiang, Wenjun Cai and Mengyuan Yu, all participants in a research and training program established by Ozcan and funded by the Howard Hughes Medical Institute. Ozcan’s research is supported by a Presidential Early Career Award for Scientists and Engineers, the Army Research Office, the National Science Foundation, the Office of Naval Research, the National Institutes of Health, the Howard Hughes Medical Institute, the Vodafone Americas Foundation, the Mary Kay Foundation and the Steven and Alexandra Cohen Foundation.